May criticized for avoiding TV debate. British Prime Minister Theresa May's gamble on a snap election was under question on Thursday after a YouGov opinion poll showed her Conservative party's lead had fallen to a fresh low of 3 percentage points just a week before voting begins. Loyalties of the past are eroding in the Welsh town of Merthyr Tydfil, a stronghold of the Labour Party since its birth more than a century ago and a former powerhouse of now departed heavy industries. Teeside, North East England - Prime Minister Theresa May gives a speech on Brexit. Reuters UKBritish Prime Minister Theresa May looks nine seats short of winning a majority at next week's parliamentary election, a model from polling company YouGov estimated on Thursday, a smaller shortfall than the 16 seat gap shown a day earlier. ICYMI: Prime Minister Theresa May gives a speech in Teeside, northeast England, after being criticized for not attending yesterday's TV election debate. Reuters UKPrime Minister Theresa May's lead over the opposition Labour party has almost halved to eight points in the space of a week, an opinion poll from Panelbase showed on Thursday. No Brexit deal is the worst of all deals, says Corbyn. Brexit campaigner Nigel Farage is a "person of interest" in the U.S. investigation into possible collusion between Russia and Donald Trump's presidential campaign, the Guardian reported on Thursday citing unidentified sources. LIVE: Labour leader Jeremy Corbyn gives a speech on industrial strategy ahead of the general election. Conservative Party spokesman says Telegraph newspaper report on PM May planning to change finance minister is complete speculation. While campaigning in Yorkshire, Labour leader Jeremy Corbyn reacted to U.S. President Donald Trump's decision to leave the Paris Climate Agreement saying it was a reckless and dangerous decision. Political leaders in Northern Ireland are casting next week's British election as a referendum on whether voters want to be part of the United Kingdom or neighbouring Ireland. JUST IN: Ipsos Mori poll puts Conservative lead at 5 percentage points compared with 15 points on May 18th. Ipsos Mori poll shows Labour at 40 percent compared with 34 percent on May 18th. The British lawmaker who beat Brexit campaigner Nigel Farage in a 2015 national election battle has been charged with criminal offences related to spending on the campaign, prosecutors said, a week before a fresh national election. Scottish leader Nicola Sturgeon said she still expected Prime Minister Theresa May's Conservatives to win a majority at next week's national election, but was no longer certain it would increase. 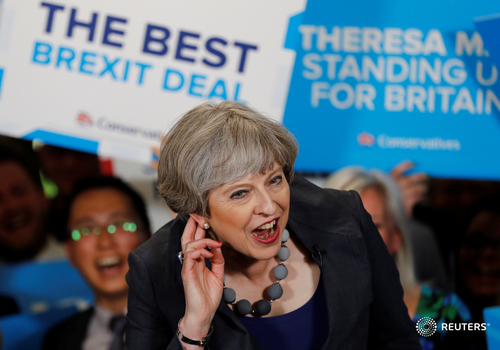 Britain's June 8 election could be much tighter than previously thought, meaning that Prime Minister Theresa May could fail to win a clear majority in the 650-seat parliament. Reuters UKBritish Prime Minister Theresa May's once formidable lead has been eroded to a slender advantage, an opinion poll indicated on Friday as her campaign was dealt a blow when one of her candidates was charged with electoral fraud. After a militant attack on a nightlife district of London this weekend, British Prime Minister Theresa May will resume campaigning on Monday just three days before a national election which polls show is much tighter than previously predicted. Britain needs to have "difficult conversations" with Saudi Arabia and other Gulf states about the funding of Islamist extremism, opposition leader Jeremy Corbyn said, resuming his election campaign after a deadly attack in London. Prime Minister Theresa May said Britain must be tougher in stamping out Islamist extremism after attackers killed at least seven people by ramming a van into pedestrians on London Bridge and stabbing revellers in nearby bars.